Summary: Wandersong sings with love and care in ways that are unlike many other games. If you want a video game to give you a warm hug, Wandersong will do that. Finally, a bard for me! In Wandersong you are a simple bard who dreams of becoming a hero, even though you don’t have a fancy sword or cool magical explosion beams, you do have…. Uhhh… a sunny disposition and a song in your heart! And don’t they always say that “Attitude is Everything”? Well, the end of the world is here, and nobody else seems to be doing much to stop it, so The Bard steps up and attempts to challenge the status quo by doing the only thing they know how to do: sing. Wandersong never gets more complicated than a normal puzzle-platformer video game, but instead of jumping between platforms you are using a large color wheel, reminiscent to the game Simon, to control The Bard’s song pitch. The pitch you sing at then, affects the world around you. Sometimes you are controlling plants that take you to higher ledges, and other times you are blowing wind or shifting boxes to move about. Wandersong plays it really safe and conventional when it comes to its design. For all seven chapters of the game, you will arrive in a new town, get a quest to solve someone’s problem, solve it, and then go to that town’s dungeon to get a fragment of “The Earthsong”. Once you get all the fragments, then you can save the world and win the game. It stays very tight to this formula in a way that may become predictable, but that is also one of Wandersong’s main strengths. Whenever the game starts to get predictable, the tone of the story will take an abrupt shift and The Bard’s attitude changes. Throughout the story, we deal with themes of coping with loss, depression, fear, jealousy, imposter syndrome, and a wide spectrum of other normal mental health issues, and while other heroes simply see these issues as monsters and try to kill them, The Bard confronts them: not out of dismissal or to “fix” them, but to comfort and heal them. The gods and the kings of the world try to stop our Bard by telling them “this world is past saving”, or “the world always ends like this and stopping it will probably make things worse”, or even “you aren’t good enough to save the world”. And these are the things that hurt us more than any sword or arrow could, but that is what makes The Bard so strong. Wandersong’s Bard is a beacon of hope that we see not only shines bright for others, but can also shine bright enough for themself. I find The Bard to be an inspiring figure and the world that they inhabit is vibrant (if a little disconnected feeling). Every character you meet on the road has quirks and personalities that make them seem really fun to hang out with and they each grow over time. Many characters reminded me of my friends and filled me with longing to reconnect with them. You get to make friends with ghosts, goths, pirates, punks and princes and not only do they grow through meeting The Bard, but The Bard changes and is affected by them as well. Connecting with other characters feels special, they do a good job of remembering you throughout the game (or not remembering you, as the case may be) and it makes everyone in turn feel special. You can almost always sing or press the dance button during any cutscene or dialogue, which leads to expressive moments where The Bard can feel a full range of joy, fear, or sadness. I feel like it is so important to let the main character show emotions and Wandersong, for all its cartooniness leaves a lot of room for both loud emotions and quiet, more reflective emotions. I love how good & evil is a constantly negotiated character trait in Wandersong. Characters may be labeled as “evil”, but often through communication you are allowed into the minds of characters who have done wrong to the player, and only when characters deny you that communication is when you find truly destructive evils. Wandersong takes a stand that says it is important and safe to judge others as you would yourself, but nobody is perfect and allowing people failures and showing grace is a truly heroic virtue. Wandersong sings a song that moves all the way through your body to your hands and your feet. It gets you moving and feeling in radical ways despite the game’s deceptively simple styling. It’s just a puzzle-platformer with a singing gimmick, but it also brings a careful and meditative perspective on how we examine mental illness in ourselves and illness in the world around us. The Bard’s commitment to saving the world is inspiring and hopeful, and even though it goes long and the simplicity can leave a bit to be desired, it is an extremely important game for folks to play in 2018, and shouldn’t be missed. 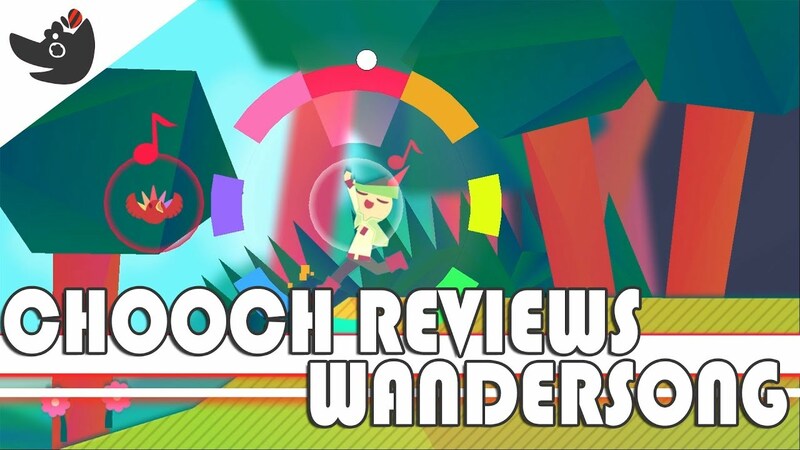 Video Game Choo Choo awards Wandersong a 4 out of 5.